Performix athlete Ryan Klarenbach leaves the earth behind when he trains. All you need to do the same is your body, a bench, a bar, a medicine ball, and the bravery to learn! The best bodyweight-only training can't be categorized in simple muscular terms. It's full-body, and this routine is no exception. 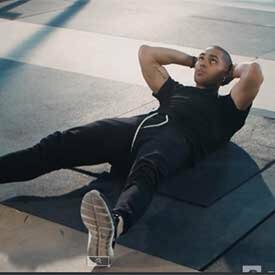 You're going to work the entire body from head to toe, giving special attention to core stability and developing those powerful, explosive fast-twitch muscle fibers. Yes, some of these exercises are pretty hard—maybe the first one most of all—so take time if you need it, and rest as much as you need. There are some alternatives listed for the most advanced movements as well. But I still encourage you to push yourself past your comfort zone. This style of training is about exploding your expectations! 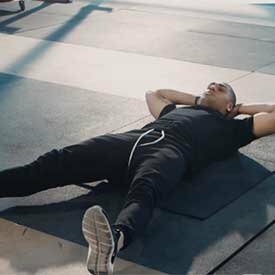 Depending on how much you rest, this workout should take you anywhere from 30 minutes to an hour. Do it 1-2 times a week, and you'll be faster, leaner, and lighter on your feet than you thought possible. 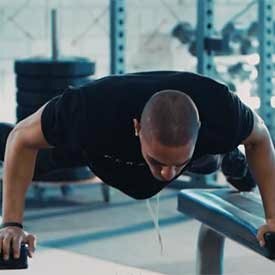 Pre-Workout Powder For Explosive Workouts! 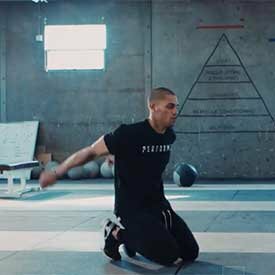 This may look way beyond your abilities, but take it rep by rep and you'll figure it out. 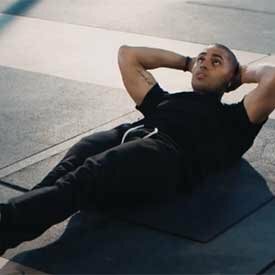 Start in between two benches—heavy, stable ones—in a push-up position. Then explode up onto the benches and come back down into the starting position. 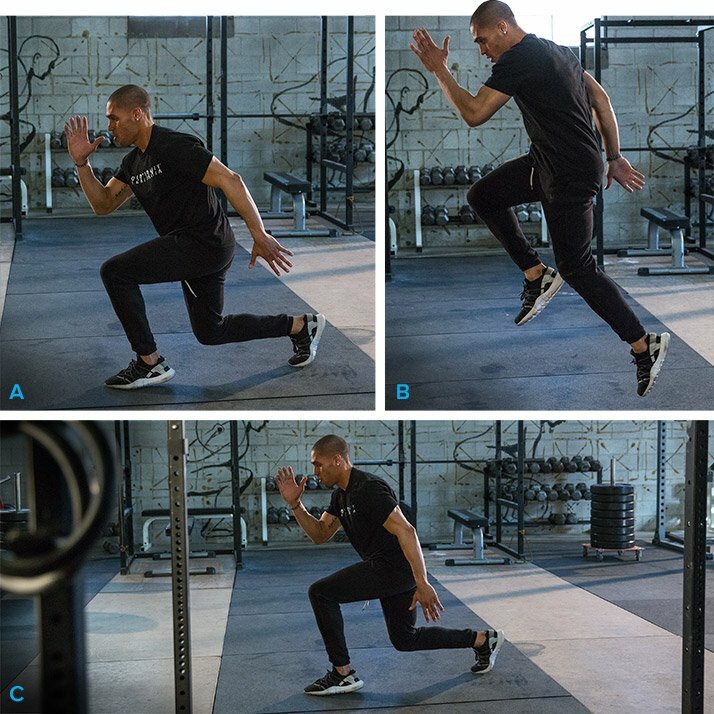 It's easy to look at this as an upper-body push, but it's really a full-body movement. You'll even need to use your foot to get that extra leverage to reach the benches. 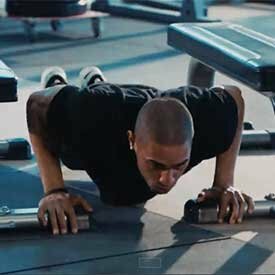 If this is way out of your reach for now, do another explosive push-up variation like clapping push-ups or superman push-ups. 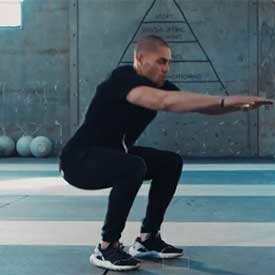 This isn't the same old jump squat. 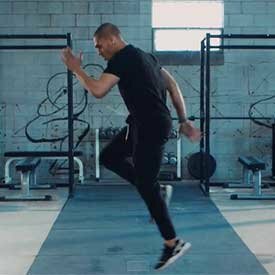 You'll start from your knees, and using your arms for momentum, explode up onto your feet, and then into a standing position. You're definitely going to feel this in your legs, but your lungs and heart are going to be seriously involved as well. Take your time in between sets, because you're going to be pretty winded doing this. 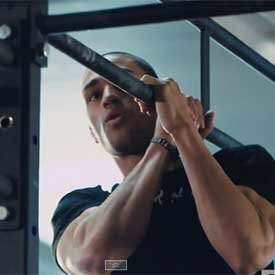 This type of pull-up fits perfectly into a full-body workout like this one, because you're going to be incorporating your back, lats, and pretty much all of your upper body. 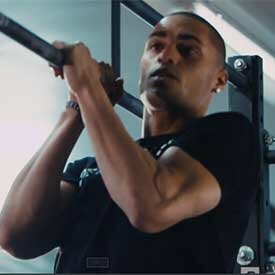 Keep each rep slow and controlled, and try to touch your shoulder to the bar on each rep. Your body will really want to twist, but use your core to try to keep it neutral. 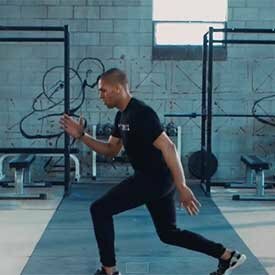 This is a unique lunge that will really force you to be explosive. Start in a lunge position with your back knee off the ground. Explode up, bringing your back leg all the way around and up high, but then all the way back down and back. Each rep starts and ends in the same position—not with the opposite leg forward. Think about making a scissor movement while you're up in the air. It can be tempting to get out of control with these, but focus on keeping your back straight and being really controlled on each landing. Having your feet elevated introduces a whole new level of difficulty and an additional stability challenge. 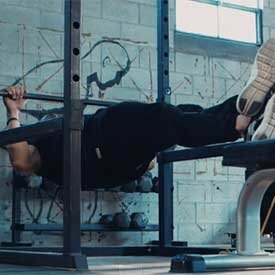 You may be able to knock out 20 reps or more with your feet on the floor, but don't be surprised if 12 reps is a serious challenge here. 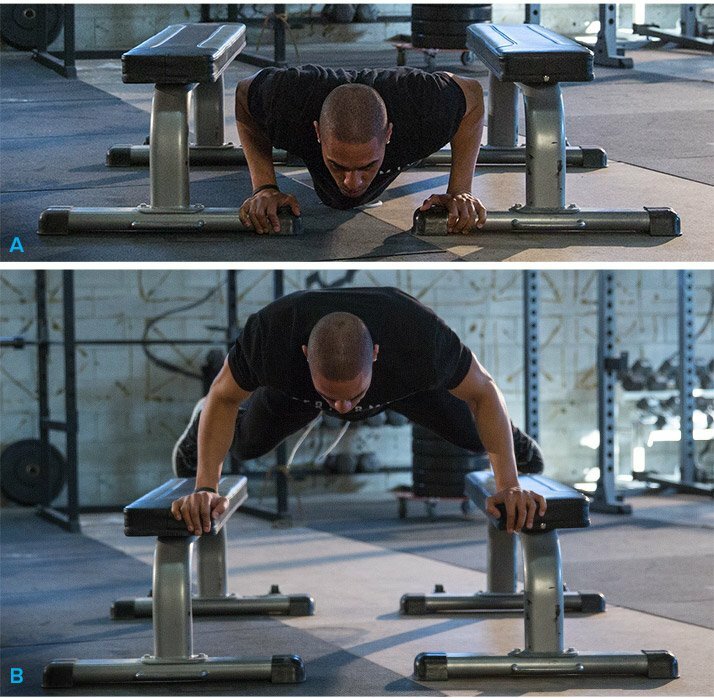 The key here is to keep your back straight the entire time and get your chest as close as possible to the bar. You'll find you end up using your core quite a bit to keep your body flat while rowing. 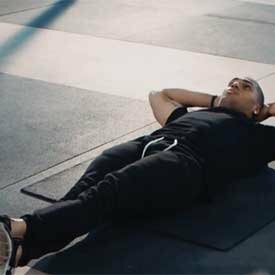 Once again, you'll be elevating your feet to make this push-up variation far harder than one on the floor. 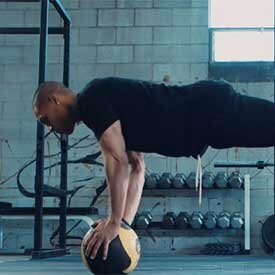 To further up the challenge and add instability, you'll narrow your base of support by putting one foot on top of the other and your hands on a medicine ball. 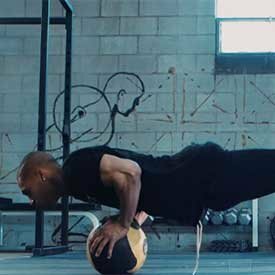 Your body is going to want to sway on the ball, so you're going to have to really use your core and plenty of other muscles to stabilize it. This is a straightforward burner of 60 total reps, hitting the upper and lower abs along with the obliques. Keep it strict! This may not look like a lot of work on paper, but take my word for it: Once you've got the form down on the explosive exercises, they take enough out of you that this can be plenty! Focus on getting better, and getting more explosive, and this workout will pay off immensely.